Um, what could possibly go wrong? Apparently, cops in Staten Island will no longer respond to routine fender-benders because they take up too much manpower, NY1 reported. But Myles Miller’s scoop suggested that such collisions may not be reported anymore — which raises questions about whether our “data-driven” Department of Transportation will know which intersections are the most dangerous. Reminder: There were 9.500 non-injury-causing crashes in Staten Island last year, or roughly 26 per day. If, suddenly, none of those were reported, would the DOT pay attention to hot spots anymore? We’ll be asking. Everyone covered the MTA’s announcement of service improvements, but we focused on the implication for congestion pricing. Meanwhile, amNY focused on how riders aren’t feeling it. The Daily News focused on how unimpressive the improvements really are. The Post, of all places, played it straight. Patch was unimpressed. The Post wisely followed Streetsblog’s coverage of suburban lawmakers’ anxiety about desire to take money away from congestion pricing. In case you missed it, Paul Berger had a nice scoop in the Wall Street Journal about how much control Gov. Cuomo exerts over the MTA (even as he says he doesn’t). And, finally, the Bike Jumble is back — so set your calendars for May 18 (when it will probably rain, if prior years are any indication). As I said, I believe service has improved, because though I only ride once or twice a week, I haven’t had a commute from hell in a long time. Whereas at the peak of the problem — back before the MSM was reporting on it — it was happening seemingly every time I took the train. 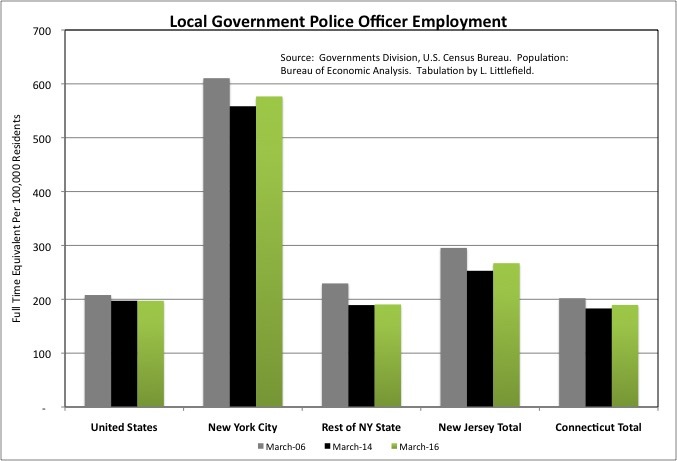 Only 2.9 times as many cops relative to population as the U.S. average in this city, including the extra 1,000 dues paying members Mark-Viterito gave them specifically to improve traffic enforcement. Robbed. Robbed. Robbed. Robbed. How do they even have the nerve to say these things? Perhaps the fact that no one will dare to contradict them has something to do with it. What the serfs don’t know will allow us to keep hurting them more. Here are two stories Streetsblog missed by not covering the MTA’s claims of improved terminal on time performance (OTP) between Feb 2018 and Feb 2019. First what does OTP mean from a customer’s perspective. A 75% OTP means trains were late 25% of the time. If a person uses the subway system 10 time per week, then that person should expect to be late 2 1/2 times during that week. That’s not a statistic that should give the transit operator bragging rights. Consider the OTP reported by the NYC Board of Transportation for the Jan-Jun 1949 period. The IRT’s OTP was 87.47%; the BMT’s 99.19%; the IND’s 99.24%. The 99.2% OTP means that trains were late 0.8% of the time. A person could expect one late train for every 125 trips. That comes to a late train once every 3 months, for a hypothetical 10 trip per week rider. The report noted the MTA isn’t satisfied with 75% and is aiming higher. Have they said how much higher? Second, the MTA gives the impression that the improved OTP directly translates into shorter travel times. There are two ways to improve OTP: decrease travel time; and increase the scheduled travel time. A comparison between the Feb 2018 and Feb 2019 schedules reveals that the MTA’s OTP improvement is based on the latter strategy. The average scheduled trip duration on the #2 from Flatbush to E 241st increased from 1:37:33 to 1:42:55. The return trip increased from 1:38:16 to 1:42:27. The average scheduled trip duration on the #3 from New Lots to 148th St increased from 1:09:10 to 1:13:14. The average return trip duration increased from 1:08:39 to 1:11:19. The average scheduled trip duration on the #4 from Utica Ave to Woodlawn increased from 1:06:19 to 1:10:56. The average return trip duration increased from 1:08:13 to 1:12:37. The average #5 scheduled trip from Flatbush to Dyre Ave increased from 1:23:59 to 1:28:55. The average return trip duration increased from 1:25:15 to 1:31:55. This strategy wasn’t limited to the IRT trains. The average scheduled trip duration on the C from Euclid to 168th increased from 1:08:00 to 1:10:58. The average return trip duration increased from 1:07:29 to 1:1:09:51. There are many more scheduled trip duration increased that are less than 1 minute. Every second counts , as, Mr. Byford is quick to note. If the MTA were honest about reporting the OTP metric, they should have included what the OTP would have been using the scheduled 2018 trip durations. That would permit MTA board members, elected officials and the public to judge how much the improvements are real or the result of not so fancy number fudging. The bigger issue is this. No one is investigating and explaining why service collapsed from 2014 to 2016. According to MTA reports employment did not fall significantly. Did everyone decide to stop working — and then start working again? Were faulty parts installed? Was it all deferred maintenance? Why wasn’t the deferred maintenance announced when it was decided on? Without that investigation and explanation, how can we be sure that it won’t happen again?